Happy almost-weekend! I’m helping to start it right by holding a Godiva giveaway! 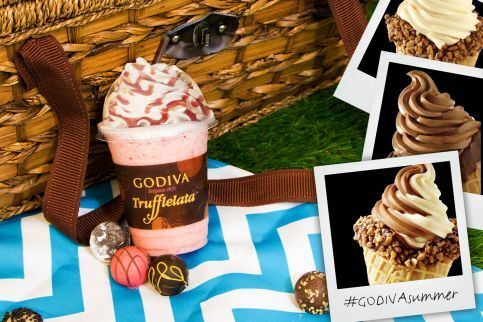 Godiva selected me and a few other bloggers to be their summer social ambassadors, and help spread the word about some of their new creations for summer. 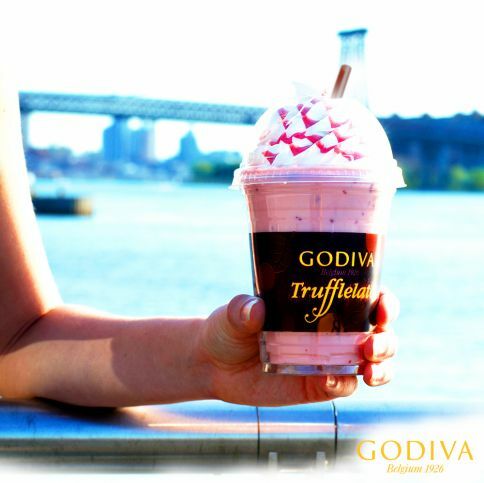 Their Trufflelata is a frozen shake blended with one of their truffles for an extra-rich experience. You can choose from six flavors ranging from salted caramel to hazelnut crunch. I guess this means I can have my truffle and sip it as well! Godiva is also premiering their in-house Belgian soft serve ice cream. There are three flavors: Dark Chocolate, White Chocolate Vanilla Bean, and the mandatory Swirl for those who just can’t decide. They also offer Belgian waffle cones that can be dipped in milk or dark chocolate, just in case you aren’t feeling indulgent enough. Both of these items will be appearing (if they haven’t already) at Godiva boutiques everywhere. I’ll be at a special Godiva summer social in San Francisco next week premiering these items, but you can get in on the celebration as well: I’m giving away five $25 Godiva gift cards to lucky Dessert First readers! 2. You can have up to three more entries by following me on Facebook, Twitter, or Instagram. Just leave another comment here for each account you’ve followed. The contest will run until next Friday, August 1. I will announce the winners on Monday, August 4th. This is a sponsored post. I have been compensated by Godiva to attend their event and received the gift cards for a giveaway. All opinions in this post remain my own. my favorite sweet treat in the summer is hand-churned black raspberry ice cream! Anhhhh – favorite summer treat: ice coffee made with cold brew, poured over a glass full of nugget ice (like the kind they use at Sonic). Drink the iced coffee, and … the best part…. eat the ice! left message on twitter about my favorite summer dessert!! i love fresh fruit milkshakes in the summer. Affogato-something about espresso with creamy gelato that is perfect for the heat. Favorite treat is frozen hot chocolate from Serendipity! Favorite summer treat — Lychee smoothie with boba! ice cream, ice cream and some more ice cream please! I like boba drinks in the summer (or really, anytime!). Homemade chocolate truffle ice-cream. Mmmmm…. Root Beer Float is so tasty in the Summer. I love soft serve ice cream with sprinkles in the summer. I love a Java Chip Frap from SBucks. My favorite summer treat is blackberry pie. Summer sweet treat fave is pinkberry frozen yogurt with mochi toppings! i love chocolate cheesecake! any time of year really.. i guess im the summer i like to add fresh fruits on top! My favorite summer treat is Blackberry/Blueberry cheesecake ice cream! I love a nice fresh bowl of summer fruit! My favorite sweet treats are the crazy melons and stone fruits this time of year. I’m also following you on Instagram @superdupermanda. I like an ice cream sundae. My favorite summer sweet treat is any kind of ice cream…. Ice cream cones–pretty much any flavor, I’m not picky! Today is really a scorcher and for me drinking a nice cold glass of mulberry Vimto does the trick, with plenty of ice. My other favorite summer treat has to be cold sliced watermelon 🙂 Love your blog and happy summer. Homemade strawberry or peach ice cream! Favorite summer sweet treat? It’s a toss-up between homemade ice cream (peach!) and icy-cold rum-blended drinks! My favorite summer sweet treat? Chocolate ice cream! 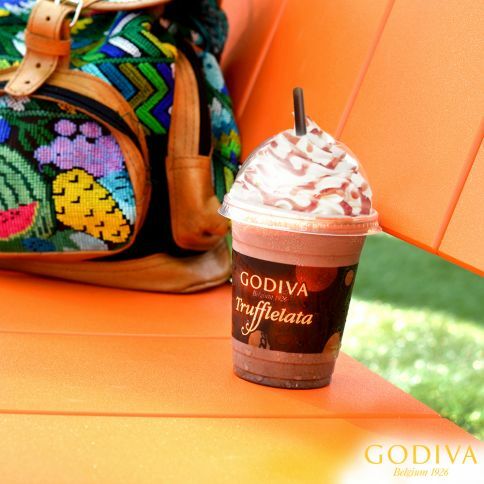 Oh…and I love Godiva’s frozen treats just as much! 😛 Thanks for hosting the giveaway! And I’m following you on Instagram now. smores are my favorite summer treat. My favorite treat is any sort of ice cream. My favorite sweet summer treat is brownies and lemonade! Anything with ice cream is my favorite summer treat! My favorite summer treat is ice cream! I love anything with ice cream! milkshakes, ice cream by itself, ice cream sandwiches, etc. My favorite summer sweet treat is chocolate chip cookie dough ice cream. phew! we just moved here from Belgium…so, land of the chocolates..makes me happy to hear the indulgence is live and well in SF too! my favorite treat would be some sort of iced caffeinated beverage, probably. hope to see you around at one a bloggers event around town! My favorite summer treat would have to be taro frozen yogurt. Monster Cookie Dough Ice Cream! My favorite summer treat is Rocky Road Ice Cream! Mango or green tea ice cream mochi is yum! Ice cream all the way! Specifically, ice cream with toffee or caramel in it. Mmmmm. I love cold, fresh fruit–nothing beats it when it’s hot outside. Definitely all kinds of ice cream! My fave summer treat is the Mocha Float: A compilation of high quality dark chocolate ice cream, and cold hard coffee. It’s bliss.